When Rochelle Rose and Tania Parker met during the 2016 production of Sister Act a beautiful friendship was born. Having both worked professionally as well as being tutors of their craft for many years, they had a vision. It was a vision that has resulted in Wing It Productions coming to life. We have the experience to produce international quality theatre while bridging the gap between amateur and professional art by gathering an outstanding team of fully professional people who are well placed to offer the training ground. Wing It will work tirelessly to provide opportunities in the wider community, and champion the causes that we are both passionate about. Nunsense by Dan Goggin at Gryphon Theatre, Wellington. Limited season of 14 shows from 30th January 2018 to 10th February 2018. To train and support new and emerging artists to excellence in all fields of theatre through mentorship, coaching and the provision of challenging theatrical opportunities. To build a sustainable and ever more vibrant theatrical community for the top professionals and talent they work with, helping to ensure they are retained here in Wellington. To create a bridge into professional theatre, allowing our many talented amateur artists to participate at the highest professional level in our capital city. To form a bond between Wellington’s many and diverse theatrical enterprises which encase a wide range of cultures and genres. Relaxed performances for people living with disabilities and for family groups to ensure they are comfortable and performing arts are accessible. Events and Galas to raise funds and awareness of charities for the hungry and homeless like the Soup Kitchen. Wing It Productions Ltd has already signed a contract for the Australasian rights to Nunsense, the longest running off-Broadway hit ever. Writer Dan Goggin, a strong supporter of community theatre has, after seeing our original concept and philosophy, granted Wing It Productions Ltd these rights and on March 29th 2017 released the TV pilot (https://www.youtube.com/watch?v=CdB3NAnfjbc) which is available on Netflix in many different countries. We are facilitating a New Zealand premiere and an invitation to Dan Goggin to coincide with our show. Approaching the script: Lyndee-Jane Rutherford. These topics have been chosen in consultation with Wellington Footlights Musical Theatre, related to their need, and interest from Porirua Little Theatre members, Coasters and Kauri Theatre Company. The workshops include just three of the genres covered in 'Nunsense' which features tap dance, opera, comedy, musical theatre, puppetry, ballet and country and western. There is scope for further workshops from our multi-talented and multi-skilled group, including the mentoring of local people in such areas as production, stage management, set design, lighting design, technical production skills and other backstage roles. The focus is sustainability, through a model of profit sharing and also fund raising. Through our theatre company, we hope to create a pathway to professionalism, we are in discussions to raise $3000 of food supplies for the 2017-18 financial year for the Sisters of Compassion Soup Kitchen at 132 Tory Street. Future projects are an original co-production for the Dance On Trust Gala and then Handel's ‘Rinaldo’, in association with award winning Executive Director of Kickstart - Steven Stead (former ENO Director) in 2019. Lyndee-Jane Rutherford has worked extensively in theatre and television since graduating from Toi Whakaari/New Zealand Drama School in 1993. She has performed in over fifty professional theatre productions including Who Wants to be 100?, Troy the Musical, and In Flame for which she was nominated for Chapman Tripp Actress of the Year in 2003. She was also nominated for Supporting Actress of the Year for both The Hollow Men and Mauritius in 2008 and 2010. Lyndee-Jane is a respected director having led successful seasons of Who Wants to Be 100? and Penalties, Pints and Pirouettes at Palmerston North’s Centrepoint Theatre and Love Puke, Becoming the Courtesan and Hamlet Dies at the End at Bats Theatre in Wellington. She won the Chapman Tripp Award for Most Promising Director in 2006 with her production of Love Puke. Lyndee-Jane is often recognised for her roles in television series such as Skitz, What Now TV, The Hothouse and the pre-school sketch comedy show Giggles. Michael was born in Petone and studied Music at the Wellington Polytechnic. He made his professional debut as Musical Director in 1983 with Tom Foolery at Circa Theatre. Since then he has been responsible for productions throughout New Zealand, Australia, UK and Asia. In 1988 he was Musical Director for oNZtage at Expo 88 in Brisbane. He spent the following year in Sydney where he was Assistant Musical Director for Evita and repetiteur / alternative 1st keyboard in Chess. He returned to New Zealand in 1990 and since then has been Musical Director of National Tours of Ken Hill’s Original Phantom of the Opera (also in Japan), Blood Brothers (also in Australia), The New Rocky Horror Show, Boogie Nights and Starlight Express plus many shows in Wellington including Downstage’s Sweeney Todd, the Gareth Farr/Paul Jenden musicals Troy and Monarchy and many WMT’s productions including Hairspray, Phantom of the Opera, Grease and Sister Act. He was also the musical director of Carrie the Musical, for WITCH, which had it's New Zealand premiere in June 2017 at BATS theatre. He wrote the music, lyrics and script of Lonely Heart and his movie musical Upstage is in post production. He produced and arranged Sue Dunlop’s album Random Deviations. Michael is married to actor Emma Kinane and they’re the parents of Barnaby and Claire. Jane Keller graduated from The Ohio State University with a Bachelor of Music, Bachelor of Music Education and a Master of Vocal Pedagogy. Although classically trained and with over 30 years operatic experience, Jane’s real loves are musical theatre, cabaret and jazz. U.S. audiences will remember Jane appearing in many musicals and being the principle comic mezzo with the Columbus Light Opera Company. Since moving to NZ 29 years ago, Jane has concentrated on writing and performing her cabaret shows. Jane’s first two one woman cabaret shows BIGGER IS BETTER and DO I HAVE TO GET NAKED? were performed in New Zealand and the U.S. to critical acclaim. BOOMERS BEHAVING BADLY had a three week sell out season at Circa Theatre in Wellington and then a hugely successful 5 week NZ tour. Jane’s most recent cabaret show YEP, STILL GOT IT ! premiered at Circa in 2015 to rave reviews and full houses. Jane, Geraldine Brophy and Michael Nicholas Williams collaborated and performed FLORAL NOTES in Wellington at Circa in 2012 and then toured NZ. Geraldine wrote this show for herself and Jane. Jane specialises in teaching musical theatre singing styles and repertoire. She has a large private singing studio in Wellington. Jane also teaches singing on the Musical Theatre Course at Whitireia. Jane has been a long time tutor at the NZ Singing School. She has also taught in the Jazz School at NZSM and was the singing teacher for many years at Toi Whakaari: NZ National Drama School. Born in Gisborne, New Zealand, she attended Gisborne Girls' High School and was Head Prefect in 2001. She moved to Auckland to attend the Unitec School of Performing Arts.Bronwyn is of Ngāti Porou tribal ancestry, through her father. She made her stage debut at the age of nine when she played a workhouse boy in a local production of Oliver Twist. At high school in Gisborne, she had distinctive achievements in oratory, music, drama and korero Māori. She was one of 18 students chosen from an applicant pool of 160 to attend Unitec School of Performing Arts, that same year travelling to London to study at Shakespearean hub The Globe. Theatre Credits - The Father (Circa), PSA Stranger Politics (BATS), Weed (Circa), Three Days in the Country (Circa), PSA Election Special (BATS), School Dance (Centerpoint Theatre), Jack and the Beanstalk (Circa), Dexter's Amazing African Adventure (Blue Baths), La Casa Azul (Circa), The Choice (Blue Baths), National Tours of HMS Pinafore, South Pacific, The Buddy Holly Story & Oklahoma (Ben McDonald LTD). TV Credits - Dirty Laundry 'Aroha' (SPP), Auckward Love 'Arataki' (Working Edge Productions), The Brokenwood Mysteries 'Holly Collins' (SPP), Go Girls 'Cody' (SPP). Tania is a graduate of Trinity College of Music London and was a runner-up in the Elizabeth Schumann Lieder Competition. She has studied under David Harper and is currently studying with Flora Edwards. She is a recipient of the Evelyn M Harrison Scholarship and The Trinity Scholarship and has appeared in international performances. Her experience includes three years with Opera New Zealand and four years with Holland Park Opera as well as regular engagements in roles in companies in both UK and New Zealand. Tania produced the Opera RINALDO for Trinity College, with award winning Director Steven Stead from ENO and sang the role of ‘Eustasio’. Professional engagements include ‘Third Flower Maiden’ for PARSIFAL under conductor Nicholas Braithwaite. ‘Dido’ from DIDO AND AENEAS and recently ‘Bloody Mary’ from SOUTH PACIFIC, for Brent John Stewart as well as a role for Holland Park Opera as a ‘Pilgrim’ in La Forza del Destino. 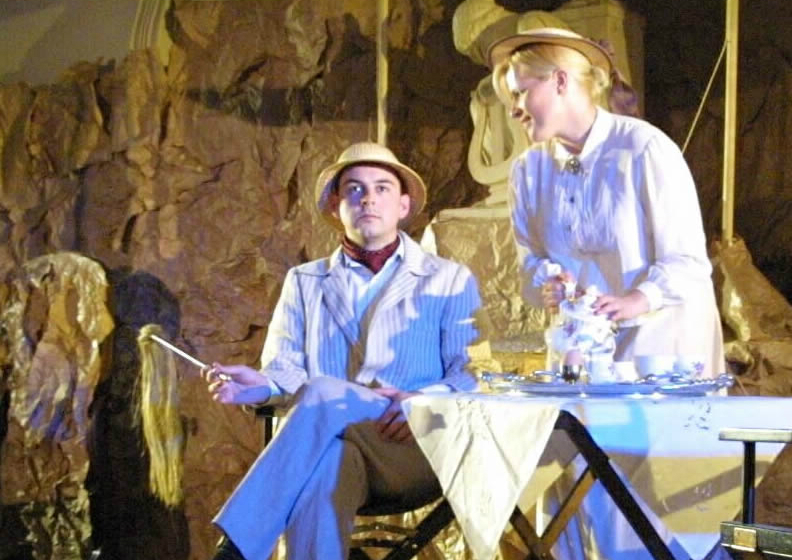 During her time at Holland Park Opera 2008-2011, she worked with conductors such as Sir Richard Bonynge and Jane Glover, and was directed by Simon Callow from FOUR WEDDINGS AND A FUNERAL. Tania has been a member of Footlights for the last two years and has loved being "Elle's Mom" in LEGALLY BLONDE and "Nancy D/Waitress" in A NEW BRAIN. She loves comedy, and trained as a Medical Clown Doctor. She has become the iconic voice of ‘Helga the Opera Singer’ in the international bestselling iPhone app MONSTERS ATE MY CONDO for Cartoon Network. This was nominated for a BAFTA in 2013. Rochelle grew up in and is now a senior tutor at the Jean Goodman Dance Studios where she teaches Ballet, Tap, Jazz and Body Conditioning. She is also a freelance performer and has worked on a variety of film, television, corporate and stadium events. Rochelle has also trained at the Broadway Dance Centre NYC, Edge Performing Arts Centre LA and did the ROCKETTE EXPERIENCE at Radio City Music Hall NYC. She spent a year at Wellington Performing Arts Centre training in Commercial Dance. Rochelle was Assistant Choreographer on Peter Jackson’s KING KONG and worked closely with Naomi Watts, Jamie Bell and Lee McDonald. Previously she was a performer for the LORD OF THE RINGS world premiere. On stage she has taken lead roles in SISTER ACT, 42ND STREET and HAIRSPRAY. She has also featured in PHANTOM OF THE OPERA, CATS and WEST SIDE STORY. Television credits include THE BIG NIGHT IN, dancing for Ray Columbus and Tina Cross and she was both a dancer and instructor on various episodes of GOOD MORNING. Rochelle also danced on a television special featuring John Paul Young who sung his hit song LOVE IS IN THE AIR. Rochelle was on the Choreography Team for the IRB SEVENS Opening and Closing Ceremonies for 10 years. More recently she has provided choreography for (and was also an extra in) Stage Right Films’ UPSTAGE and Circa Theatre’s season of DEAD TRAGIC. Rebecca is a graduate of Whitireia Performing Arts Centre with a Bachelor of Applied Arts (Performing Arts) where she trained in singing, dancing and acting for three years (2014-16). She found her love for performing arts after taking various dance classes from the age of seven and later found a passion for singing and acting. Through out high school she participated in many shows including West Side Story and Chess The Musical. In 2013 Rebecca had the opportunity to perform one of her favourite roles, Roxy Hart, in Wellington East Girls’ College production of Chicago. During her final years at college she also performed roles including Katrin from Mother Courage and Her Children, and Pauline from Daughters of Heaven. She then went on to perform in the 2014 Wellington Summer Shakespeare’s production of Macbeth as well as being a member of Long Cloud Youth Theatre. In 2015 she was cast in the ensemble of Circa’s production of The Mystery of Edwin Drood directed by Lyndie-Jane Rutherford. Rebecca was also cast as Debby in the 2015, New Zealand premiere of Serial Killer Barbie The Musical. Attending an intensive workshop at The Actors Program in Auckland, Rebecca had the chance to work with tutors such as Peter Feeney, Paolo Rotondo and Rita Stone. She has also been involved with numerous development workshops with internationally recognised acting coach Miranda Harcourt. In 2016 she attended a four week acting residency at the National Institute of Dramatic Arts in Sydney and performed in the New Zealand premier of Legally Blonde The Musical with Wellington Footlights Society. Her most recent role was Frieda in the New Zealand premiere of CARRIE The Musical with WITCH. Graduate of Imperial College London and UCL with a Masters of Remote Sensing. He now is Wing It Productions IT support; tasks include excel spreadsheet magic and creator of the wingit-productions.com Website. Ben is director, designer, marketer and performer based in Wellington New Zealand. His work as a director includes Rent (2015), Last Meals (2016), Legally Blonde the Musical (2016) and his most recent production of Carrie the Musical with the theatre company WITCH, where he is the co-founder and director. Ben graduated from Victoria University in 2015 with First Class Honours in Theatre and a minor in marketing, which led him to work professionally in creative marketing and design. He recently played ‘Joey’ in Sister Act the Musical with WMT and is now featured as a professional actor in the upcoming production of Peter Pan at Circa Theatre. Adele earned a Bachelor of Music in Performance form Victoria University in 2005. She has appeared in several WMT shows including Les Miserables, Ovation!, My Fair Lady, Jesus Christ Superstar, The Phantom of the Opera, Mamma Mia! and Sister Act. Adele is a costume and fashion designer and seamstress, who loves making creations for herself, her family and friends. She works in banking and is combining a successful career with motherhood, to Dita who is a two year old. She is using her wonderful management and artistic skills for this production and will be stage manager and assisting the design team for "Nunsense" to develop her arts management skills. Adele sang professionally as the alto soloist in Vivaldi's "Gloria" performing recently in Upper Hutt, and is understudying Bronwyn Turei as Sister Mary Hubert. Adele is currently singing in Rock of Ages with Porirua Little Theatre in November. Libby’s passion for costume design was awakened after her daughter started dance classes and she began making costumes for the studio. Through this, Libby joined the wardrobe department of Wellington Musical Theatre, first working on their 2013 production of Phantom of the Opera. Since then she has worked on Grease, Mamma Mia & Sister Act all for Wellington Musical Theatre. Libby’s skills have expanded to front of house, backstage dressing and props handling. She has also sewn a range of theatrical draping for Metro Productions. Libby has a strong management background coordinating artisan markets in the wider Wellington region. She assists artists and designers to showcase their products and encourages small business and new creative projects within the community. Libby is excited about her role as wardrobe manager for Nunsense as well having the opportunity to be mentored in other areas of production. "I can’t wait to expand my skills and rise to the challenge that Wing It Productions is providing me". Kevin Orlando is thrilled to join the Wing It Productions Team! Kevin has been living in New Zealand for 3 years now. He has played Princeton in a New York Regional production of Avenue Q and has played various roles in productions with the Wellington Footlights Society including the role of Jason Dean in the New Zealand Premiere of Heather’s: The Musical. Along with Musical Theatre, Kevin is also pursuing a career as a Voice Actor, as well as finishing a double major in Film and Theatre at Victoria University. Musical comedy shows provide an audience with great entertainment, but they also require performers of exceptional talent who are not only musically proficient, but who also have the acting skills, and energy, to generate the comedy required. 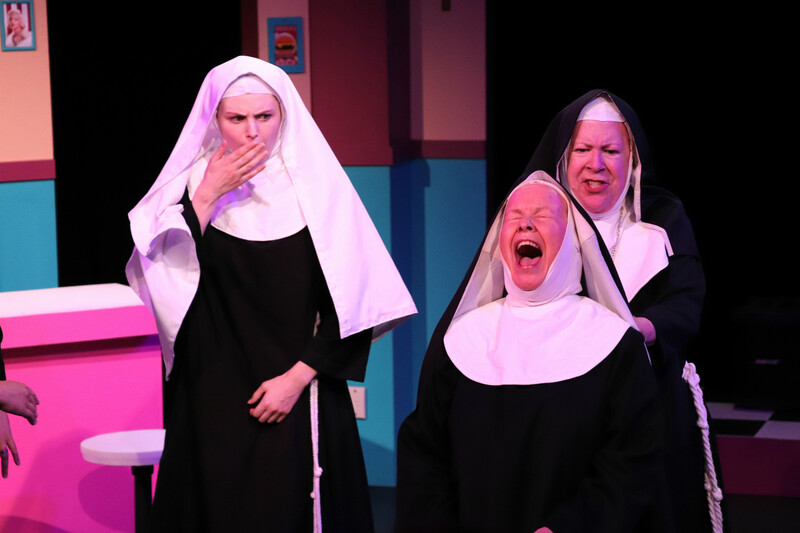 Fortunately, Wing It Productions Ltd have all this and more in their production of Dan Goggin's Nunsense, a light-hearted and irreverent musical comedy about a group of nuns, currently playing at the Gryphon Theatre. The five nuns in question are the sole survivors of the Crofton Downs Convent, following the deaths of the rest of their fraternity from botulism after eating Sister Julie, Child of God's vichyssoise. Unfortunately, they have insufficient funds to pay for the burial of the four remaining nuns, so they decide to put on a talent show in order to raise money for their funerals. And so, Nunsense is essentially a series of song-and-dance routines showing of the talents of the five nuns and Dan Goggin's way of mocking the stereotypical perception of nuns in a convent and satirising many of the dogmatisms and doctrines of the Catholic Church. All of which is played out to the max in a high-octane show with director Lyndee-Jane Rutherford, musical director Michael Nicholas Williams and choreographer Rochelle Rose producing stellar performances from an outstanding cast. Full of confidence and energy, the five actors work as a tightly controlled unit, bringing lots spontaneity and creativity to the production, each making their character uniquely their own. Not only do they bring all this alive through their acting skills, but they are all excellent singers and dancers as well. Jane Keller leads the group with a great performance as the Reverend Mother, her comic antics at the end of the first act absolutely brilliant. As her sidekick Sister Hubert, Bronwyn Turei is a great foil to her, with lots of animated humour, while Rochelle Rose as Sister Robert Anne also has some wonderful comic moments. 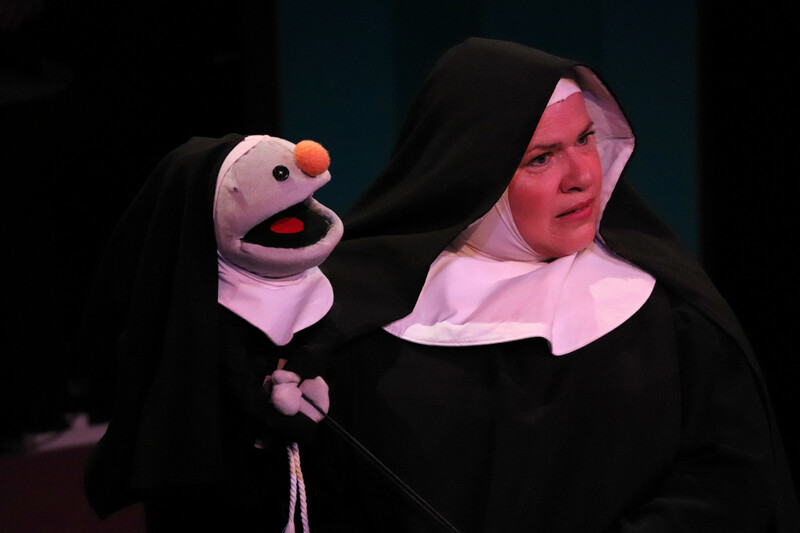 Tania Parker, as the country-and-western nun Sister Amnesia, has a great puppet routine and Rebecca Tate, as the novice Sister Leo, shows off her dancing skills to great effect, to make this toe-tapping whimsical show a great night of entertainment. With a full house of supporters and sponsors, the Gryphon is alive with the sound of Nunsense. Written by Dan Goggin over 30 years ago, Nunsense is one of the longest running Off-Broadway musical hit shows in history. Given tonight's performance by Wellington's newest theatre company Wing It Productions, I can see why. What a gem of a production! From the get go the Little Sisters of Crofton Downs have the audience clapping, cheering, confessing and dissolving into raucous laughter. The premise for the story – the sudden death of fifty two Nuns through food poisoning – is probably not supposed to be funny, except it is, especially when re-enacted by Sister Mary Leo's (Rebecca Tate) dying Nun ballerina. The dilemma of how to pay for the burial of the last few bodies currently on ice in the cafeteria freezer, results in a fundraiser variety show performed paradoxically on the set of the local schools production of Grease! (Set design Ben Emerson and Jeff Hewitt – also lighting designer). 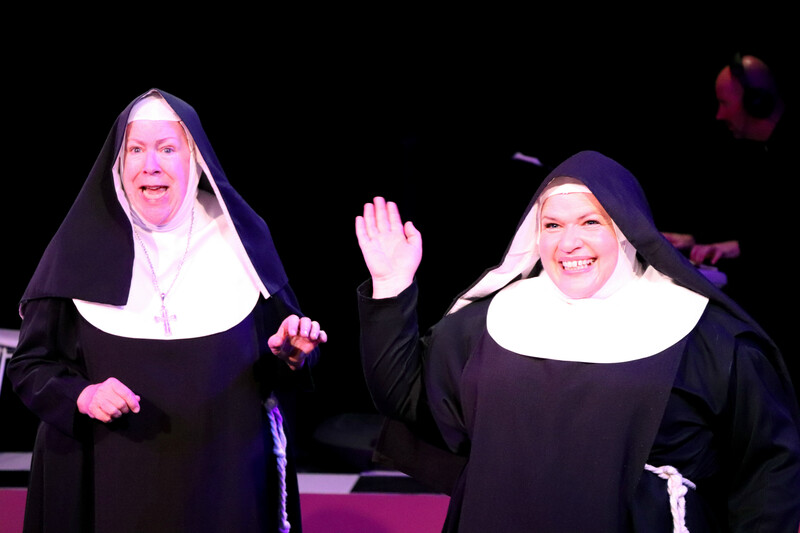 The hilarious, irreverent and yet thankfully not gratuitously offensive revue that follows is packed with show-stopping song and dance numbers with plenty of 'convent humour'. There is obviously scripting license to make things local and topical and director Lyndee-Jane Rutherford has cleverly put a Wellington and Kiwi-ana flavour into this production. She is expertly supported by her production team – one man band and maestro Michael Nicholas Williams and choreographer Rochelle Rose, who also plays Sister Robert Anne with vim and vigour. All five performers are fantastic and these dynamic and challenging characters give them all a platform to inhabit (ba dum tish) their roles and show off their craft with everything from puppetry, ballet, Marx Ba rother-esque comedy, and plethora of musical theatre singing and dancing styles. The choreography is slick and the ensemble choral sound (I love that there is no added amplification) is resounding with excellent harmonies, although the head voice tone is sounding tired overall. But the energy pouring off the Gryphon's intimate stage environs is infectious – which is amazing, given the heat and their costumes! 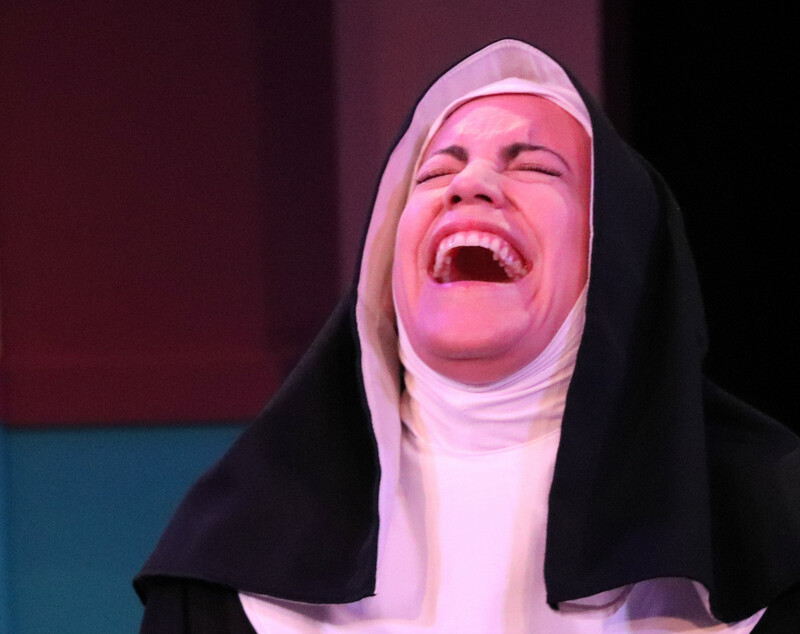 Jane Keller's Mother Superior is quick witted and her physical comedy in a scene where her character discovers some ‘sinful' temptations is uproarious. (It also wouldn't surprise me if those burlesque feather fans turn up again in a one woman show some time). Sister Mary Hubert (Bronwyn Turei) delivers pithy one-liners, funky moves and outstanding soulful vocals – bringing the house down in the final number, ‘Holier than Thou', in true Sister Act style. Tania Parker as Sister Amnesia (the nun who has forgotten her name because a crucifix fell on her head) brilliantly duets with the foul-mouthed puppet Sister Mary Annette in ‘So you want to be a Nun'. Her character seems to have forgotten which vocal style to sing in too as she runs the whole gamut of vocal timbres from opera to country (I could have gone to Nashville)! Such a demanding role, executed with panache. It isn't just a frivolous farcical story though. Given that the writer based these characters on Nuns he knew while growing up, we do get an impression of the truth in the relationship between the characters, their dreams and aspirations, quirky humour and fun and the feeling of care and community within all the hilarity and pastiche. So no matter if you are practising or lapsed in your religious persuasion, or not a believer at all, it's well worth seeing this wonderful production in all its Gloria-veil. Nunsense begins when the five sisters of Crofton Downs discover that their cook, Sister Julia, ‘Child of God’, has accidentally poisoned 52 of her fellow nuns with an extremely questionable soup. Having dug deep into their coffers, the surviving sisters have managed to bury 48 of the dead bodies, as well as purchase a Smart TV and a PlayStation. With the health inspector knocking and 4 dead nuns chilling out (sorry) in the freezer, our sisters must raise the funds needed to respectfully dispose of the last of the dead. What better way to fundraise than put on a talent show? 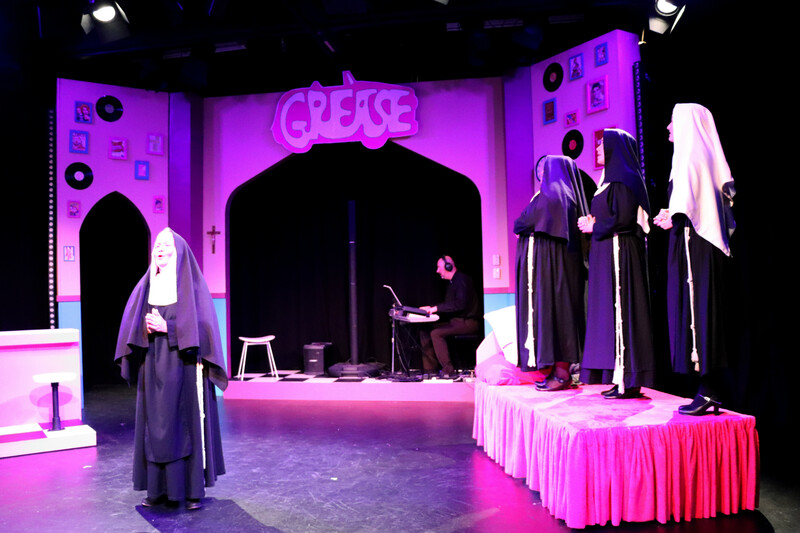 And so, in a school hall currently decked out with Grease memorabilia (set design by Ben Emerson and Jeff Hewitt), our nuns put it all on the line in a singing, dancing, puppeteering extravaganza. It’s a great premise best developed in the hands of a playful director, and that’s exactly what we have here. The little quirks of the show – the reverent reference to Berhampore, and the Kiwi-as sweet-as bro-as attitude of Sister Robert Anne (Rochelle Rose) for example – really sparkle. The cast is outstanding. Though their execution of Rose’s clever choreography was not perfect, the actors clearly possess godsmacking talent. Jane Keller (playing Reverend Mother) delivers a spirited performance and is outrageously funny when her character is confronted by the mortal sins of man. Bronwyn Turei (Sister Hubert) gives an animated yet focused performance, grounding the excitable ensemble around her. Her vocals are remarkable, as are Tania Parker’s, who plays the delightfully befuddled Sister Amnesia with adorable panache. Rebecca Tate (Sister Leo) plays a nun coming into her own with cheek and charm, while Rose brings mammoth energy to the table. Mention must also be made to Michael Nicholas Williams, the exceptional musical director who drives the entire production with just a keyboard. 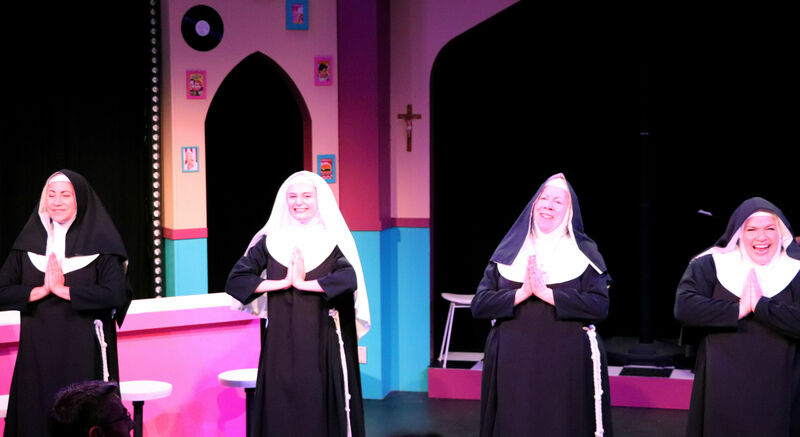 Nunsense is fun, frivolous, and funny – it’s enormously entertaining and a great escape from the daily grind.